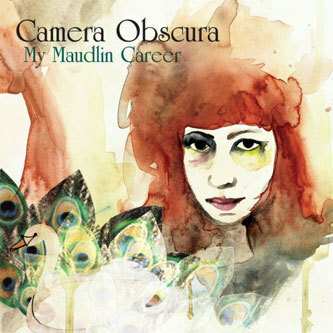 My Maudlin Career is Camera Obscura's debut full-length outing for 4AD and their fourth in all. The band resume their working relationship with producer Jari Haapalainen, resulting in a similarly '60s, Phil Spector-type aesthetic to that heard in his work with Swedish popsters The Concretes and Peter, Bjorn & John. My Maudlin Career has been billed by the band as a darker album than anything they've come up with previously, but it's hard to think of these songs as radiating anything other than pure radio-ready sunshine. Defeating all else, the epic orchestration behind 'The Sweetest Thing' is sheer bliss - almost too saccharine for its own good but for the subtle melancholy in the delivery of vocalist Tracyanne Campbell. The same goes for the sparkling xylophone melodies of 'Swans': it comes close to nursery rhyme banality in its excessively civil tunefulness, but there's a real sense of weariness nestled away at its core. Offering a glimpse at another side of their sound, 'Careless Love' marks out an especially successful downbeat moment, sounding like a full-blown Dusty Springfield ballad, full of heartfelt, cinematic romance. There's real crossover potential in Camera Obscura's take on the girl group sounds of yore - heck, if the likes of Ronson and Duffy can scrape by off the back of plundering the 1960s, there must be quite some audience out there for material with this level of finesse. Recommended.